My recent post on cupolas, Cupolas Create Curb Appeal, was quite popular and I’ve received quite a few questions regarding vinyl cupolas. I personally have not used a vinyl cupola but I did some research and there are quite a few manufacturers. Two of the sites that I found with vinyl cupolas are, SkyArt Studio and Gallary and The Architectural Depot. The advantages of using a vinyl cupola are quite obvious. Unless you’re looking for a natural wood appearance, a vinyl cupola is going to last for many years maintenance free. In the past I’ve used cedar cupolas and painted them, inside and out to protect them from the elements. With the vinyl cupola, you can just add one top coat with any color you like and then it should last for many years. The down side of a vinyl cupola is cost. 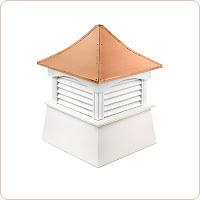 A quick survey of suggested retail prices indicates that most vinyl cupolas will run two to three times the cost of a good cedar cupola. The last cupola I installed was approximately $600 and an equivalent vinyl cupola costs approximately $1800. However, the time savings in painting and maintenance over the years is sure to be worth it. I wish I had done some more research on these before I put my last cedar one up. I know some day down the road I’ll be up on my ten pitch roof painting it and wishing I had vinyl!